Games that can be played at internet casinos are provided by companies like Microgaming and Net Entertainment. 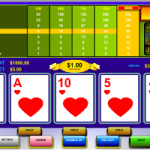 They specifically develop software for the online gambling market. Most operators offer between 100 and up to 700 different games which include a wide variety of slots, table games, progressives, live casino, sports betting, poker, video poker, lottery and speciality games. Some progressive jackpot slots offer incredible payouts. The software, depending on the provider can be downloaded and installed as a program or you can simply login to the casinos’ website and enjoy the games via your browser. The choice is yours, both versions have decent games. Even today, many female gamblers are intimidated by table games. They’re afraid of making a mistake since most of the tables are occupied by men. The latest research indicates that women will only play table games if they feel secure. To this end, slot machine versions of virtually every table game are now available in the big casinos, allowing female players to play blackjack and roulette in privacy. A large percentage of female players don’t trust the software used by most casinos. This compelled casinos to come up with a near perfect solution: hybrid games. Not only are bets placed electronically using touch screens but the game is also played live. Casinos love these games since there can be as many as 30 betting players at a single table. The consoles can cope with small bettors and the occasional high roller. Simply put, hybrid games is the perfect platform for players to learn the games at low stakes. Many casinos in the United Kingdom now offer hybrid Punto Bunco (Baccarat), with rows of betting desks allowing 30 to 40 players to bet on each coup. The hands are dealt from a standard eight deck shoe, monitored by cameras. The players can see their hands on the screen, this adds to the excitement and the shared experience of the game. When playing Roulette, the game can be very misleading because of the ease it allows you to place your bets. Herein lies the problem. Casinos are smart since the average number of different bets placed on a touch screen is higher than at a table. The same applies for baccarat. Don’t be tempted to wager a couple of dollars on the terrible Tie (or Egalite) bet, just because it’s so easy. Rather bet on the Bank or Player. We have been playing online slot machines for the last 5 years. Like most people we did not need any instruction, just credit your casino account and simply press the button. Having lost copious amount of cash over the years we decided to take action and came up with a slots strategy that would not only increase our winnings but extend our playing time as well. After all, playing slots, just like other forms of online gambling is entertainment. If it’s not entertainment for you, then we recommend you seek professional help. Slots can be extremely addictive and often described as the ”crack cocaine” of gambling. Slots are played at breakneck speed, if you’re not a disciplined player you’ll loose more cash than you’ll win. The most obvious way online casinos lure you in is with their ‘fabulous bonuses’. Virtually every single one of them offers a substantial bonus, in most cases it’s 100% of your initial deposit. These bonuses can only be used to play slots. The reason for this is simple. Slots predominantly favour the house and they’re highly addictive. Players are also kept on playing since casinos offer them continued bonuses and VIP membership schemes. Most operators offer a wide variety of poker games from Sic Bo to Three card Poker and quite a few others. There are also casinos dedicated to the various poker games such as Texas Hold’em and Five Card Stud, these casinos are commonly referred to as Poker Rooms. Here you can play against other players. You can play in live games for money or free games just for fun. In real money games, a rake of 5 percent is normally charged for the use of the poker room. In addition to card rooms poker could also be played online. You can play poker banking games like Caribbean stud, pai gow poker and video poker games like jacks or better, deuces wild and joker wild. The game is pretty much the same as it’s played in land-based settings. Instead of paying out winnings at the true odds, lower odds are paid to allow the casino to make a profit. Which Casino Games Must I Play Online?